My former co-worker, Chris Wright, was a legend in Anyang. It seemed like he knew everybody. Like a Virginia-born Jack Black, he came into work early each day with his iPod blaring classic rock, ready to tell stories of the night before. He was also the organizer and MC of Anyang’s monthly Open Mic Night. Chris also liked good food, and he had to cook for himself a lot of times. Over some beers and smoked turkey, he told me his way of making Kimchi BokkeumBap with methods taught to him by his wife. It sounded so good that I made it for breakfast the next Saturday morning. The way one gets fried rice at a Korean restaurant is usually all the ingredients thrown together at one time and stir fried over high heat. I prefer to do things in steps. The big thing about fried rice is prepping everything ahead of time. First the aromatics. Chopped onion, garlic and ginger. Then clean the refrigerator out with vegetables you need to get rid of. In this one, I have fiddlehead ferns, mushrooms, zucchini squash, and carrots, all chopped up. And don’t forget the kimchi. I rinsed it first and then chopped it. Now here’s where Chris and I are kindred Southern culinary brethren. If we cook bacon in the house, we always drain the fat into a container to save until later. I haven’t had many opportunities to use this, and you can see I’ve accumulated a lot. This is one of Chris’s secrets to his unique fried rice. Also have an egg or two standing by. And, of course, the cooked rice. We always have rice sitting around in the rice cooker. 1. Over high heat, melt a dollop of bacon fat. 2. Add the aromatics (onion, garlic and ginger) along with the kimchi and stir fry until the onion starts getting soft. Be careful not to let the garlic burn. Keep tossing it around. Immediately you’ll smell why bacon and kimchi go well together. I’m sure that you could just use chopped bacon instead of bacon fat. I just didn’t feel like it at the time. 3. Toss in the vegetables and stir fry until they get a little softer. 4. Make a well in the center and crack your egg in there. Scramble it in the pan and mix it with the vegetables. 5. It’s rice time. Dump it in and mix it by slashing it with your cooking utensil and folding it in. 6. 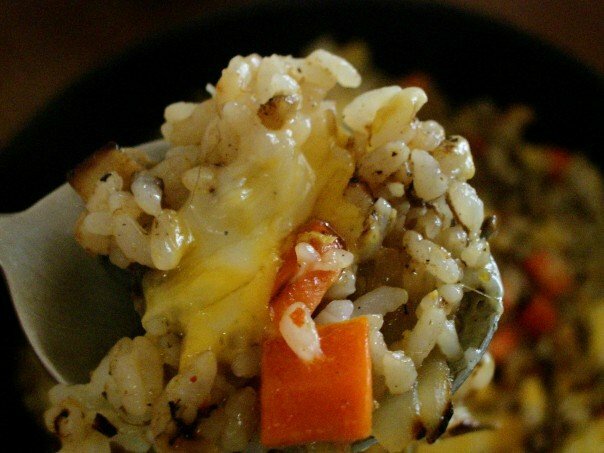 When everything is mixed and the rice gets some good color in it, top it off with some cheese decadence. Don’t stir anymore. Cover with a lid to help it melt. Serve it in the pan when the cheese has melted. If done right, the rice at the bottom would have gotten crispy. You’ve got me DROOLING here. I’ll be trying this ASAP. Looks good! I have been looking for recipes with kimchi. Bookmarked. I have a version of Kimchi fried rice I make with leftover Thanksgiving turkey. Check it out on my youtube page. OMG does that look fantastic.